Is Labor's $2,000 Battery Subsidy A Waste Of Money? 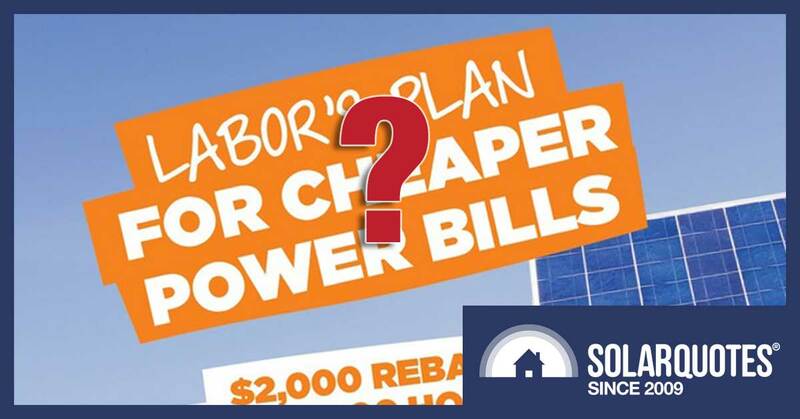 Home > Battery Storage > Is Labor’s $2,000 Battery Subsidy A Waste Of Money? Is Labor’s $2,000 Battery Subsidy A Waste Of Money? On Wednesday shadow Prime Minister, Bill Shorten, gave some details on the plans for energy Labor will throw into motion if they win the next election. According to all the little people inside my TV, this election will occur within 6 months but it may be almost a year away. A 50% renewable electricity target by 2030. Support for more transmission capacity, including a second interconnector between Tasmania and Victoria and one between South Australia and NSW. Support for pumped hydroelectric storage including the large and expensive Snowy River 2.0 scheme. Assistance for all who are unemployed through the closure of coal power stations and their associated mines. $100 million in community funding that — among other things — will help renters get rooftop solar. Provide a $2,000 battery subsidy for 100,000 Australian homes. 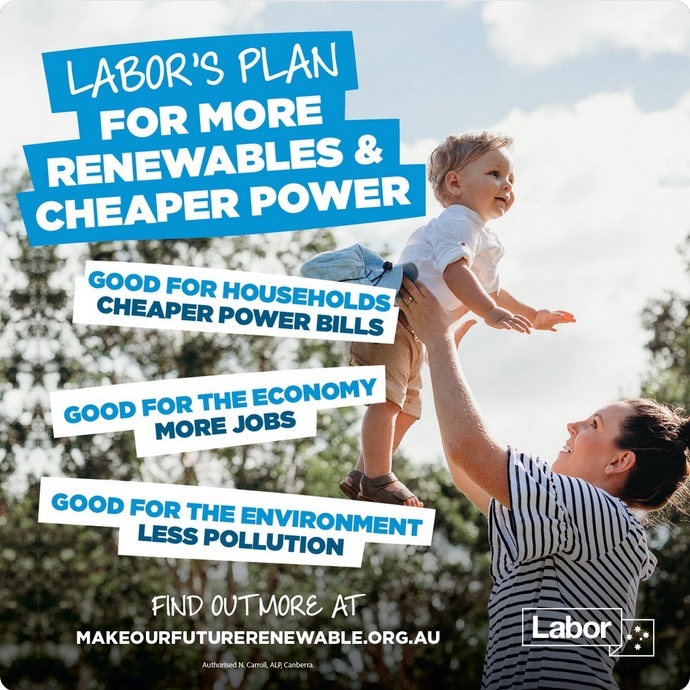 While it’s a shame Labor is making this mistake, senior members of the Coalition have stated they want to extend the operating life of coal power stations, use public funds to build new ones, subsidise new coal mines, and block the development of renewable generation. This is far worse because not only will it waste money but it will result in more people dying from air pollution and the effects of climate change. 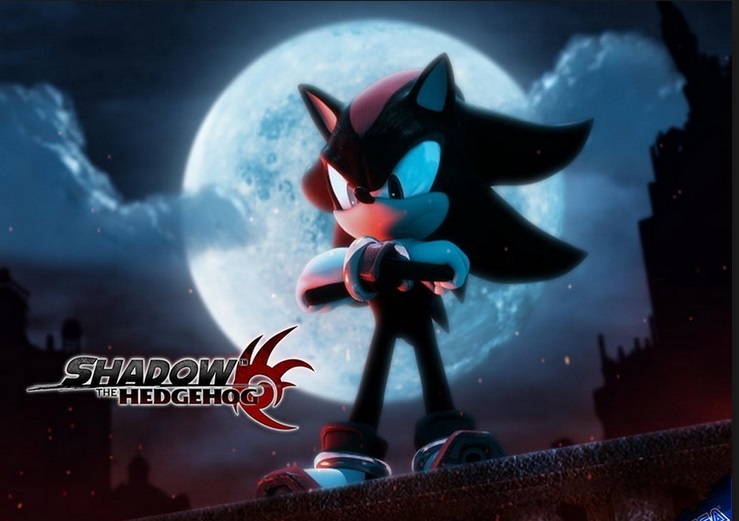 I imagine being shadow Prime Minister must be like being Shadow the Hedgehog. Except cooler. If Labor is elected, the battery subsidy will start on the 1st of January 2020 and be spread across four years. The rebate will be $2,000. It will be available to 100,000 households. Only households with a combined annual income of $180,000 or less will be eligible. There will be a maximum of one subsidy per household. It won’t be available to those who have received a state or territory battery subsidy. Low cost financing will be made available for the remaining cost of a battery system. Labor says their goal is to have one million home battery systems installed by 2025. That would be 1 in 10 Australian households. Carbon Prices: These discourage the release of greenhouse gases into the atmosphere by charging people to emit them. Greenhouse gas emissions damaging the environment. Air pollution damaging our health. But residential batteries don’t solve these problems because at the moment installing them increases greenhouse gas emissions and air pollution over what they otherwise would have been. Because of this, subsidising home batteries doesn’t solve a problem, it makes two problems worse. When I was a kid my mother would also try to balance me on slogans. If a residential rooftop solar system produces more power than the home requires, the surplus gets exported to the grid for other people to use. Each kilowatt-hour of clean solar energy sent into the grid reduces fossil fuel generation by around 1 kilowatt-hour. But if the surplus solar electricity is instead used to charge a home battery system a portion of the energy is lost. The amount varies but home battery systems are likely to supply less than 85% of the energy put into them. This means that — all else equal — each kilowatt-hour of electricity used to charge a battery will result in 15% or more emissions than if it had instead been directly sent into the grid. The manufacture of battery systems also results in emissions. They should be considerably less than what they were just a few years ago, but are still a problem. While it is possible for home batteries to store clean, renewable energy that would otherwise go to waste, outside of some special circumstances, we aren’t close to them being able to save more energy than they lose at this time. This is the case even in South Australia where solar and wind provide a higher portion of electricity production than anywhere else in the country. Home batteries may also result in higher emissions through the effect they have on the electricity market. At the moment the large majority of solar households don’t have batteries and send all their surplus solar electricity into the grid. This pushes down wholesale electricity prices, especially in the middle of the day. This is most noticeable in South Australia where up to 63% of total electricity consumption has been supplied at times by rooftop solar. When wholesale electricity prices are low or zero gas generators can shut down to avoid operating at a loss but Australia’s coal generators can’t. Because they were designed to run continuously shutting down is difficult and expensive and so they can be forced to lose money during these periods. This can make them uneconomic and force them to shut down permanently. But if households have batteries and store solar energy during the day instead of sending it into the grid it reduces the economic squeeze coal power stations suffer in the middle of sunny days and may result in them staying in operation longer than they otherwise would. At the moment unsubsidised home batteries won’t pay for themselves. I recently wrote about how this was the case even under favorable conditions. 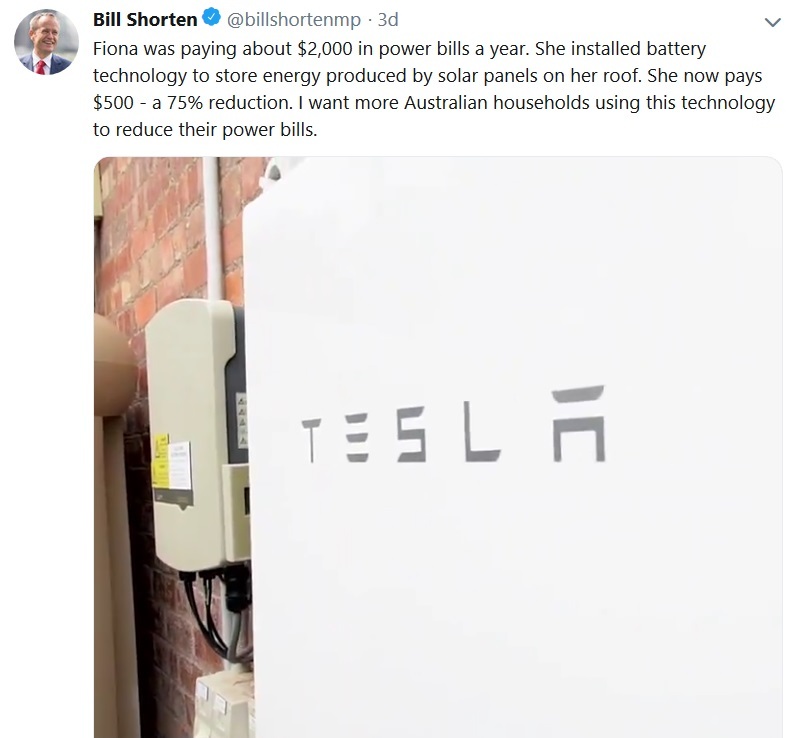 In South Australia where there is a massive battery subsidy of up to $6,000 that will be available for a wider variety of systems starting next year, it will still be easy for a household to lose money buying one. The Federal subsidy of $2,000 is small in comparison and it’s not possible to combine it with South Australia’s. Because of this — at current battery system prices — it will be very difficult for households to save money by getting a battery with the federal subsidy. This means there may be many homes that will use the subsidy and end up losing money overall, which is not a good situation for Labor to be in. Bill, that is a Powerwall 2. It is impossible for a normal household to save $1,500 a year from just this battery alone. Maybe if it was part of Virtual Power Plant that doesn’t keep all the profit for itself it could, but that’s not something normal Australians can join at the moment. I’m not saying Fiona is a fibber. She may be mistaken or simply have been taken for a ride by electricity retailers who make their plans too confusing to follow. Without large falls in the price of electricity, which we are not at all likely to get, it’s inevitable home batteries at some point in the near future will pay for themselves without subsidy. Looking at the current cost of lithium battery cells and the required hardware, it’s clear to me this is already baked into the cake. These declines in battery prices are mostly being driven by the huge sums being spent on developing electric cars. If we just wait it may not be long before unsubsidised battery systems can save households money. Once this occurs uptake is likely to be rapid. As home batteries are currently bad for the environment it makes no sense to subsidise them now. Especially when their price will drop without our intervention and we can use the money saved to subsidise something that is of environmental benefit such as solar power, electric cars, double glazing or energy efficient appliances. Why Does Labor Think This Is A Good Idea? Unfortunately, that’s not the case right now. It may be true once the benefits of being part of a Virtual Power Plant are included, but they are still being trialed and not something households can generally join. It’s possible Labor has been getting some bad advice, but I think it’s more likely they are just going with something they assume is true without bothering to critically assess the facts first. For decades fossil fuel interests and their troll minions have been complaining solar power doesn’t work when the sun isn’t shining. And the simple comeback has always been, “Batteries!” But batteries have never been required to allow solar or other renewables to lower emissions and pollution. While they can be useful for providing dispatchable power when needed, there is already an existing mechanism in place for providing dispatchable power. It called “paying people money to meet electricity demand”. they are necessary for the expansion of renewables when we are still a long way from that point. If Labor wanted to trial subsidising batteries on a small-scale in places where they would be most cost-effective, such as where they could be used to avoid the need for expensive transmission upgrades, then I think that would be just great. It would give us valuable experience that will let us be prepared for when unsubsidised batteries pay for themselves. The money that’s saved could be spent on something we know will decrease emissions rather than increase them. It would also be worthwhile to carry out more trials of Virtual Power Plants or better yet, determine the best way for battery households to buy and sell electricity at wholesale prices and receive payments for providing ancillary services that help stabilise the grid without being part of an electricity retailer’s Virtual Power Plant. This is because the big electricity retailers have proven they will rort the system wherever possible to maximise profits. Virtual Power Plants under their control would provide them with another chance to manipulate the market to their own advantage as those that run power stations do with conventional generation. 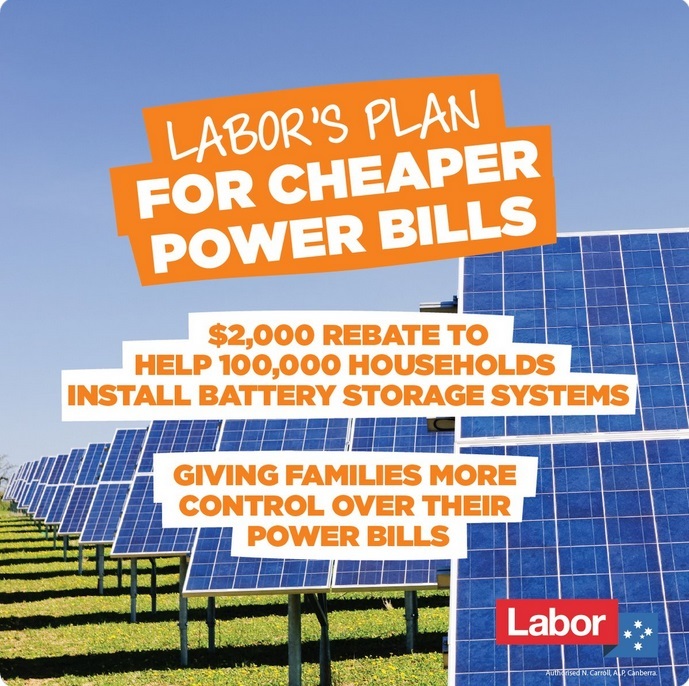 If Labor wants to incentivise the uptake of home batteries it can do so very simply without spending a cent. All they have to do is eliminate, or at least reduce, fixed supply charges on electricity bills. This would result in the price of grid electricity per kilowatt-hour increasing while overall electricity bills would stay the same — at least in the short term. This would increase the return from both batteries and rooftop solar and encourage energy efficiency. Also, it would lower average electricity bills for low income Australians while increasing them for the rich, which should be considered a feature rather than a bug by Labor. Ahhh….. now that is a well-written article! It may be well-written, Mark, but it’s nowhere near accurate. You can make ANY article sound “well-written” if you remain obsessed with relying on single basic premises and ignore all alternatives. As I have written more than several times, citing actual PER Ahfigures and my own almost FORTY years of experience, stand-alone battery MORE THAN PAY FOR THEMSELVES ~ and have done so for some years, ever since the price of reasonable-quality lead-acid batteries have been available. NOTE that 1kw @ a nominal 12-volts = about 84 ah. 1000 ah will cost you well under $TWO thousand dollars…. and you can install them yourself and use them when and how you like. NOTE ALSO that the dead l/a batteries can be very effectively recycled into other uses ~ unlike a powerwall-type battery that’s set to become a new environmntal hazard equalling single-use plastic bags. DO the arithmetic for yourself…. and then ask Ron about his irrational fixtion with the gee-whiz ‘power-wall’ scam which not only costs a shitload more but STILL allows no measure of independence from ‘providers’. my mother used to smack me around the ears ‘for my own good’. It didn’t work then, either! Get the units and symbols right. If we all use recognised units and symbols it makes the reader trust the writer. Watt is a unit of power (energy per unit time). power = current (charge flowing per unit time) x potential difference ( energy change per unit charge) (P= I.V). So 1 kW = 1000 W = 84 A X 12 V.
More useful is the amount of energy = power X time. 1 kW.h = 84 A.h X 12 V.
Agreed, especially on the supply charge. The $10 billion CEFC top up and the $5 billion for interconnection really can’t be faulted by anyone other than vested interests. The battery subsidy was out of left field and not really well thought out. Mark Butler is the smartest guy in the room in parliament on energy and I doubt he encouraged this. Whilst the mass installation of batteries now might lower the cost of running the coal burners, we need to appreciate that we’re going through the energy transition phase at this point. To lower existing coal burner operating costs ( and some wear and tear) means the owners can foresee an extended operational life for them. This, in turn, becomes a deterrent to construction of new coal-burners. In the short term existing coal burner extend their lives just a little – probably enough to see us through the transition period. But at the end of the transition the existing coal burners would be shut down and there would be no hangover in the form of a coal burner built in 2024 with a lifetime to 2074. 1. Carbon Prices: These discourage the release of greenhouse gases into the atmosphere by charging people to emit them. These National Governments legislative style “great ideas” to help reverse GHG emissions to insignificant levels (in the global context – which of course is what climate change issues refer to) are meaningless and implausible when evaluated against the backdrop of a rapidly developing and increasing population world that we all occupy together. Seven billion is heading rapidly towards ten billion in 2050. This is a key point and all the more poignant in that over half of the world’s current population survive in “energy starved circumstances” with no prospects of advancing themselves, their families, communities and nations through any ‘doomed to failure’ attempts at hobbling together current low tech generation technologies to provide more than a very sub-standard basic power source only at best. Climate change is not an Australia only issue, or one that Australian legislative policy can magically solve for all global peoples. It is a global issue that needs to be tackled from an entirely different global perspective and technological initiative (rather than local ideas or initiatives) to that which has been incorrectly promoted worldwide (minuscule scale low density generation technologies implemented at a local level) to such an extent that many ordinary people everywhere are now fixated on the hysteria around these technologies. PV, Wind and Hydro technologies are not capable of being mainstream global generation sciences in perpetuity, and many people mistakenly believe that collectively they are able to provide for the industrialisation of emerging nations (over 130); the modernisation and infrastructure renewal of all nations (195), and the commercialisation of massive energy intensive new era technologies that are critically needed to come on stream everywhere to enable the world to progress towards and maintain new age and modern living standards for all peoples globally, such as new food and water production technologies; mass transit and infrastructure development, material science and health technologies for example. What’s absolutely needed globally for all peoples in a rapidly developing and expanding world going forward is predicated on the availability of; reticulated and scalable generation of massive, clean, safe, low cost, enduring, power. Nothing less will cut it. Equally importantly and simultaneously, the cornerstone generation technology that satisfies all of the above attributes in perpetuity must also reverse dangerous GHG’s to insignificant proportions permanently and immediately, thereby halting climate change issues in their tracks. Generation technologies that will satisfy these requirements will therefore be those at or near the pinnacle of the energy density sciences pyramid. Current and new renewable energy technologies have a critically important and necessary future everywhere, but they should not be focused on as having a magical or meaningful role in single-handedly mitigating and reversing climate change issues moving forward, whilst at the same time satisfying a rapidly escalating energy intensive needy world. Well written mate. I’m not a climate change believer. I’m more of we are strangling the planet and polluting it . Overbearing deforestation ocean pollution. These things I think matter more than global warming. Given enough investment, and the subsequent drop in prices, massive battery capacity, whether in big lumps or small, can replace obsolete coal-burners with superior distributed day-night power supply, from PV alone. (Windmills are high maintenance mechanical monsters, attractively decorative though they may be.) Done quickly, it would be frightfully expensive – but cheaper than relocating tens to hundreds of millions of people, requiring construction of massive cities from scratch. That’s where an aversion to batteries is rational only in the short term, the beginning of the current accelerating radical energy transition. What will make the whole thing more economical is that CST, with its energy storage in hulking great tanks of cheap molten salt, is already providing an energy “battery” for an entire city for 4 hrs after sunset – and that’s just phase 1 of a pilot plant. Phase 2 is to provide 8 hrs … We’re technologically pretty backward here in Oz, except in SA where they at least use CST to grow some tomatoes, but when a few more CST power stations are deployed then we’ll run along behind, and try to catch up. Better late than never. The nifty thing with PV and CST is that it’s the ultimate form of nuclear power which will outlast our species. The fusion reactor is at a safe distance, particle emissions tend to bounce off the top of the atmosphere, and the “wires” are photons, providing distribution for free. So yes, it _will_ be the mainstream energy supply unless corporate interests find a way to sabotage it, e.g. by continuing to burn fossil fuels long enough to produce a Venus climate – permanent total cloud cover. Mind you, the seas rise around 60 metres in that case. An interesting experiment. IF, as you state, “PV, Wind and Hydro technologies” aren’t capable of being “mainstream global generation … in perpetuity”, THEN what energy technologies do you think are? Are you suggesting nuclear fission energy utilizing uranium and/or thorium fuels? •	Rapidly depleting (excluding thorium). Oil, gas, coal, uranium and thorium certainly aren’t capable of being energy sources “in perpetuity”. And then there’s this little pesky problem of anthropogenic climate change that means most of the remaining fossil fuel resources need to stay in the ground, otherwise we cook planet Earth (via GHG emissions) and make it uninhabitable (per IPCC SR1.5°C). Solar-PV, CST, wind and hydro are directly or indirectly dependent on the sun’s energy (which is expected to fade in several billion years, after its red giant phase where it’s likely to engulf the Earth) so technically these technologies aren’t “absolutely perpetual” on planet Earth. But I don’t think humanity needs to be worrying about this now – we probably have roughly about several hundred million years before we need to worry about the sun getting too hot and beginning to cook planet Earth. Nuclear fusion technology isn’t currently viable. Geothermal? Tidal? So, I ask you, Lawrence, what technologies do you see that are available and deployable NOW, if not Solar-PV, CST, wind and hydro, that can “enable the world to progress towards and maintain new age and modern living standards for all peoples globally”? Or do you think there aren’t any, or only partial solutions, and we are ultimately all heading towards an energy starved world? We have the privilege of being able to discuss these issues here at this website. Unfortunately, it seems to me there is little evidence of our governments (particularly Federal) here in Australia exploring these issues and working towards affordable and rapidly deployable effective solutions to mitigate anthropogenic climate change and a looming post- ‘peak oil’ and post- ‘peak gas’ world. That should concern all Australians. Apropos the need to leave the fuel stone-age, it’s instructive to “follow the money”, I think. (So many slow learners won’t listen to scientists, but bankers bet only on certainty, so are worth an ear.) Once the banks refuse to finance coal burners, and the World Bank allocates $200 Billion (over 5 years) to minimising the impact of the looming catastrophe, then we can be certain that everyone on the crew of the Titanic have seen the sonar plot, and it’s only the passengers who remain ignorant of the fact that we’re going to hit, no matter what we do. Now it’s just a matter of trying like crap to minimise how hard we hit. A few trillion spent now will be peanuts compared to delay, and do no harm to depressed economies. Earthworks to be done on my fully solar Going-off-grid build in ten days. (Having to do it as an owner-builder to get anything done.) It’s a start. Off Grid – that’s a good move Erik. What’s your plans after some earthworks being completed? Off-grid build: On the fill pad goes a 25m long 203 sq. m cementsheet clad double garage + double workshop (one for the woodworking machines, one for the lathe and milling machine), + one bedroom granny flat – as extension to the old cementsheet farmhouse from mid last century. The original building design was in straw bale, but I’m 64, not able to apply all those tonnes of render, and couldn’t find anyone to do the build, so (reluctantly) it’s now conventional cladding and insulation. If I recall correctly, the bales would have given me R5.0 or thereabouts. An admission: even for the new conventional design, I’ve had to go owner-builder, just to get the project under way. More than 5 months of chasing 6 builders couldn’t evoke one quote. (After a $250M upgrade, Sale RAAF base will train all RAAF pilots, needing more staff. That presumably contributes to the 2500 homes projected to be built around the town in the next couple of years. Mind you, now I’m vying for contractors – concreter & plumber for the slab, first off. There’s central brickwork with HWS on top of the woodbox beside the wood heater, for thermosiphoning from an in-flue water heater. (Necessitates a vented tank, so a header tank in the ceiling space. If the pressure for a fine shower is then inadequate, I figure a little DC pump will fix that.) With over 2 sq km of forest on-site, that’s 100% renewable solar stored energy with zero net emissions. Two 50,000 L rainwater tanks will be added, so I don’t have to stint with the shower. (As a kid I remember my mother washing the baby in a bucketful of water in a baby tub, then the baby’s clothes, then back in the bucket to wash the kitchen floor, and finally out on the most precious plants in what remained of the garden in the drought.) The CFA demands a separate 10,000 L metal or concrete above-ground tank with CFA fittings, reserved for their use, plus all-weather access for 15 tonne tankers, with specified turning circle options, etc. It may be manned by volunteers, but there’s nothing amateur about it, that’s for sure. I think I’ll put in transfer piping so the CFA tank can be replenished from the others – fire trucks are a lot more useful with water. Getting planning approval, then building approval on self-designed self-drawn plans was made easier by this being my second OB – and NCC Volume 2 being available on-line. Bad luck about the straw. It’s definitely an interesting building material. Finn is a number one little piggy and lives in a straw house. Apparently allergies are not a problem if you don’t go sticking your head through the wall. Also surprisingly fire resistant when done right. I think it’s already starting to happen with coal. See AFR article by Jenny Wiggins headlined “BlackRock says coal is dead as it eyes renewable power splurge”, dated 26 May 2017. But our governments (particularly Federal) think coal is still a long-term safe bet. Labor appears to be having a two-way bet. As for fossil natural gas and petroleum oil supplies, we still seem to be blindly heading for the ‘energy cliff’, promoting infrastructure projects heavily reliant on assumed abundant, affordable fuel supplies – e.g. Western Sydney Airport, continued expansion of the gas grid. Diesel fuel is currently a critical energy source for the world’s agriculture, transport and logistics. Best wishes for your own project. When you say that you are “Going-off-grid”, is that electricity supply only, or are you becoming self-sufficient on multiple levels? Self-sufficient in terms of adequate clean water supply, adequate nutritious food supply, sanitation, medical, dentistry, pharmaceuticals, etc.? Presumably you still need to pay for Council rates, communications (or are you disconnecting), income taxes perhaps, and are you staying put or do you still need personal transport to get around? Can you fix everything that will eventually breakdown/fail, or do you need outside help? What I’m getting at is we are all interconnected in this world. It’s very difficult to disconnect entirely, so if the world crashes we are all likely to crash with it (sooner or later). I think it’s better to avoid the world crashing! Something we all should have a stake in. Would you agree? It is perspicacious of you to infer that my off-gridding might extend beyond electrical power. Yes, it includes 100% of power, heating, “adequate clean water supply”, sewage, and garbage disposal. With 308 Ha., I could return to our family’s days of producing meat and vegetable requirements, but there’s no imminent need. Ah, forgot the pending henhouse renovation for own eggs. (Could grow the chook feed, but would have to fight off the kangaroos. That would provide ample meat, but I’m vegetarian now.) So, as expected, it’s more of a green-change than anything else. My stake in the outcome of the courageous climate altering experiment is reduced by having no children. I do more than many to minimise my ice-melting contribution, because we’re all in this boat together, but in a few decades at most, my personal stake ceases. With some luck, though, I’ll see the beginnings of a trend toward the new world geography, demography, and technology. Let’s remember that Greenland is rising at 3 cm per year now, due to diminishing ice overburden, the rate of ice melting has tripled in the last few years, and will increase exponentially. Just as movement of one body in a waterbed rocks the other(s), I figure we’ll see a modest increase in the rate and severity of earthquakes. Oh, and somewhere in between 1.5 and 2.0 deg C warming it’ll all melt, raising sea level by over 7 metres. It’s just the timing which is uncertain now. All very interesting, even if predictable. I am fairly new to this blog, and must be missing something? Am I to understand you are going to cut down trees and burn the wood – to produce lots of CO2? Is this supposed to be sustainable, if everyone does this (including all city homeowners and renters)? Do we actually have sufficient suitable land area (e.g. fertile, adequate water) to do this? The AMEO model (renewables only) also proposed burning trees (wood, biomass). It would at first blush seem to me better to keep burning coal (derived from trees, etc. ), and leave all the trees intact so they can continue to capture carbon and produce O2. After all – this is the method the USA, UK, Germany, and all other countries with a high standard of living got ahead in industrialisation – cheap, and readily available energy, with high power capabilities = quality of life. However, I do think we must try to phase out coal soonest – and by this I mean also not export it to China and India – but then they will not be able get ahead like USA, UK, Geramay etc. – although I do appreciate they will then buy elsewhere – so maybe a pointless exercise? I believe we do need cheap reliable energy in abundance. So, are your plans similar to the bunker building people of the USA in the 60s, preparing for a nuclear strike? Ron says the effect on CO2 of Australia sinking beneath the waves would be 3% – but other documentation suggests the amount of fossil fuel derived CO2 is closer to 1% of world production – about the same as the UK, but 15 times less than the USA, and maybe 25 times less than China (2015 figures, as I recall). A little “confirmation bias” perhaps? The UK figure surprised me – but they did ban wood stoves in cities quite some time ago, and have heaps of nuclear and wind power generation. Ian Thompson: Ron was talking exports as well. Where do you think China get a lot of the coal they burn? I also saw nothing about wood burning in previous posts? Did I miss something. Biomass probably refers to burning waste that would otherwise go to landfill – it could also refer to bio-gas, producing methane from food waste. AEMO neutral outlook for 2040 has coal, gas and biomass down to slightly less than 30% of a much higher total energy consumption for Australia. That’s what they consider reasonable and achievable given the proper framework. Projecting out to 2050 just about every coal-fired power station in Australia is scheduled to be retired. Hopefully we won’t build any new ones. Erik – I would give the Redlow a miss – too many issues I’ve read about. Apart form the fact that you have to completely empty the battery of power every 6 months or so, there have been problems with blockages, leaks, electrolyte contaminants etc. To understand the climatological difference between wood and coal burning, it is only necessary to consider on the one hand, carbon which has cycled for millions of years in the biosphere – from soil to atmosphere to biomass back to soil …, and on the other, fossilised carbon which has been safely sequestered for millions of years, out of harm’s way. When I burn one of the tens of thousands of trees in my > 200 Ha of forest, that releases stored solar energy, and temporarily cycles back into the atmosphere the carbon which it took from there to form the wood. As the forest continues to grow, the carbon is quickly removed from the atmosphere again, resulting in no net atmospheric CO2 change. In contrast, burning fossil carbon increases atmospheric CO2 by 3.29 million tonnes for every million tonnes of coal burnt. Germany has hundreds of biomass power plants connected to the power grid, most burning waste wood from forestry. (That’s 40% of a good tree, otherwise more.) What do we do – just waste it? Along with CST, it would be ideal for night-time power supply, give small quick starting power plants, e.g. using chipped wood fuel. Our government’s delusion that forests are a stable carbon store, which can be counted against coal burning, is laughable. Just look at the millions of tonnes of biomass burnt in our larger bushfires. (The Black Saturday fires alone released the energy of 1500 Hiroshima-sized atomic bombs. That’s gigatonnes of CO2 released.) Only permanently buried coal is stable and secure. It is also worth remebering that no unburnt tree is permanent, even the 2.5m diameter 30m high Redgum near our farmhouse. It was doubtless majestic when Captain Cook arrived, but it is senescent now, at an age of less than a thousand years. (My estimate) Microbial decomposition (and termites too) release methane, which is 25 times worse than CO2 as a greenhouse gas. Burning dead wood before that happens provides a net climatological benefit, even before replacing fossil fuel combustion and totally avoiding adding net carbon to the atmosphere. Granted, widespread wood heating in suburbia is detrimental to air quality, due to the fine particulates in woodsmoke. Burning only dry wood (>12 months drying, ~14% MC) with the air register wide open, and regulating heating by fuelling rate, ameliorates the problem, but does not eliminate it in built up areas. If there were enough of it, it could harm as many people as does burning coal. (Though coal burning produces more radioactive fallout, from my reading.) Our nearest neighbour is a kilometre away, through forest, so not much collective particulate build-up. The coming population initiated resource crunch will, I expect, reduce living standards, but not necessitate a high level of self-reliance, unless you live far out in the sticks, and then it’s always been a case of bake your own bread or drive for hours to buy some. The transition to higher levels of recycling will be good for the planet, and employment. What we need is a kickstarter project to build another CST power station, since government is so inadequate on energy matters. Hi Mondo – couldn’t see a REPLY button on your post – hope you see this. “There’s central brickwork with HWS on top of the woodbox beside the wood heater, for thermosiphoning from an in-flue water heater. (Necessitates a vented tank, so a header tank in the ceiling space. If the pressure for a fine shower is then inadequate, I figure a little DC pump will fix that.) With over 2 sq km of forest on-site, that’s 100% renewable solar…”. Reference to the AMEO modelling of 100% renewables by 2030 and 2050 was made in another post – I can’t recall which one – I download and read through this on my phone. Talked about using a significant amount of Biogas, and also Biomass, which they identified as wood. I was somewhat flabbergasted…! I mean, I know wood can be considered renewable – and arguably recovers CO2 from the atmosphere – but it is doing that already, so why don’t we instead keep the trees – even plant more – and burn the coal while it is cheap, plentiful, and available – is it really much worse than burning wood, which also emits nasty contamination? But my real point – we need to get away from coal – but I think wood also – if the objective is to make maximum impact on global warning/climate change/ice cap melting/loss of coral reef, or whatever. The AMEO study excludes nuclear, gas, coal, and carbon sequestration options. However, natural gas has a low carbon-hygrogen ration, so I’d think it would produce much less CO2 per unit of energy produced, than either coal, or wood (I’ll have to go check the lower calorific values, LCV’s). Mondo, the Redflow battery might well be 100% discharged once a week, to meet the “once every 120 pump hours” automatic limit, if I understand correctly. It would be a matter of running the breadmaker, etc., when the limit looms, then trigger the scrub early in the morning, so that a good charge can be recouped during the day. It does seem that a second battery could be a good idea, or an overcast day at the wrong time could necessitate firing up the generator – wait, a bit of fuel in the generator doesn’t cost $14k or whatever is the current price. The electrolyte is bought in by Redflow, I believe, and the contaminated batch does appear to be a one off. And on farms, even a drum of diesel is supposed to be stored in a bund – a low bucket big enough to retain the drum’s contents in the event of a spill, and even lead-acid batteries should be in a spill-retaining tray, so any battery leak would simply be a warranty claim. That seems to make them too expensive, as you need three times the nominal capacity for equal utility. The only problem that I have with subsidies of any sort in the renewable energy arena is that with a few exceptions, the money goes straight to China, which is permitted to continue increasing its emissions until 2030. This seems totally counterproductive to me. Given their intransigence in the South China Sea, that 2030 date will end up being ignored. Many of the points you’ve raised are valid, Ron, especially in terms of state-by-state comparisons. Considering the miserable 7c FiT in WA, we’ll quite likely apply for that $2K battery subsidy federal Labor has promised, particularly as its arrival may coincide with the arrival of the Model 3 and even the Model Y in Australia. Our hapless premier here in WA has just approved fracking of north-west regions of our state, with the vague promise of unspecified funds for renewables. This almost certainly means we’ll (have to) vote Green in WA, just to create a brake on McGowan’s pseudoscience. * Swore off the Greens years ago, when they attacked our fishing rights… but any loss of WA’s precious water reserves is an infinitely worse scenario… . 1. We should remember what are the initials for Bill Shorten as the name is used, and, for what else, those initials represent – kind of describes the policy. 2. I prefer the policy of the Greens – regarding clean energy, including banning all new coal mines (unlike the new, 140km square open cut coal mine, approved by the Queensland ALP government), and, the phasing out of all coal extraction, exporting, and, burning, in Australia. It is unfortunate that, due to the stupidity of partisan politics, the Greens party cannot happily share the policy, without claiming ownership, and the ALP cannot adopt it, instead, regarding it as bad, simply because it originated outside the ALP politburo. 3. The report above, seems (to me) to exclude mention of (although, it is mentioned in one of the comments above), the intent to increase funding to the CEFC, to $10,000,000,000 (I won’t use the word billion, as its current usage, is a fraudulent misrepresentation). To me, the CEFC would be of significantly greater benefit, in using all of its available funding, to provide to owner/occupier homeowners (including mortgagees, who don’t yet own their homes), no-deposit, interest free, loans, to purchase (including installation), domestic rooftop photovoltaic systems, with battery backup to provide for blackouts, with the loans repayable over the term of the system components’ warranties. To use such loans, means that the money is not single use, and, is not lost to the government – instead, the money is recyclable – as it is repaid, it can be used to fund further such loans. And, it would mean that households that can not afford to fund even “subsidised” domestic rooftop photovoltaic systems, with or without batteries, would still be able to obtain them, instead of making “subsidies” available, that would benefit only rich people, who have thousands of available dollars laying around. 4. And, regarding the use of batteries storing energy from domestic rooftop photovoltaic systems, for powering VPP’s, this should all, be fully funded by the electricity retailers, including the software needed, to regulate the amount of power going into the grid, and, the amount going into, and then, when applicable, being drawn from, the batteries for grid use. 5. And, as it is mentioned in the comments, fracking should be banned across Australia, be federal legislation. Wow! An explosion in a comma factory. There are many areas of Australia with poor electrical reliability and network limitations due to high voltages. Some areas, like Bundeena (south border of Sydney) are having solar installations blocked and/or export limited due to the high (15-20%) penetration of home solar. Furthermore, all solar system inverters (in the last 5 years?) are required to export limit / shutdown when network voltages become too high, eg 11am to 2pm. Let’s be very clear that distributed/home solar is a direct threat to the established profit machine of existing (fossil) generators, and the corporate owned electrical system has no incentive to fix these issues. If the utilities can have VPP capability and some capacity of the battery (maybe 25-50%) for voltage stability purposes, it would go a long way to stabilising the grid. While the basic “we’ll give you $2000 to buy a battery” scheme in it’s undetailed form may be poorly thought through, if they stipulate VPP control, in some form, it will greatly benefit everyone. Couple of bits of errata in the Ronald’s piece. A kWh put back into the grid does not necessarily = a kWh saved of coal generation. If our energy transmission system is about 85% efficient then that is about the same as a battery. Yes that works both ways. It also doesn’t take into account that a kWh put back into the grid doesn’t just displace coal generation – it could in fact displace renewable energy. There is also the problem of over-generation where a rooftop system throttles and energy is just wasted. Also batteries don’t pay for themselves but he left out one important point – batteries don’t pay for themselves in their warranted lifetime. But assume that for LiFePO4 system well looked after (lives between 80 and 20%DOD) that you get 25 years then it does pay for itself. I know Ronald will argue he can only work on the warranty, but the problem is home lithium storage systems haven’t been around long enough for anything but a guestimate. And finally if these batteries are installed with “smarts” they can help stabilise the grid in times of peak demands and lower overall energy costs. I agree with the comment re suppliers arranging their price so as to match the subsidy. My first solar panels cost $8 per watt – guess what the subsidy was – yeah $8 per watt. I recall that when hybrid vehicles like the Prius first arrived on the scene, we were warned battery replacement after seven or eight years would render this initiative expensive. Didn’t happen. Those early models are still operating well, particularly useful as taxis in the US and Canada… and recent data shows that Prius hybrids are high on the list of the ten vehicles Americans _keep_ for 15 years or more… . Your argument that batteries could extend the life of coal-fired power stations is an important and concerning point. We need to be phasing out coal-fired (and gas-fired) power stations as soon as possible, preferably by 2030. 100,000 battery units is a serious quantity to contend with for end-of-life recycling/disposal, and you say Labor’s goal is to have ten times that number installed by 2025. I wonder whether there has been any thought by Labor policy-makers of recycling/disposing the batteries when they inevitably expire (in several years’ time for lithium-ion technology), or is this too long-term thinking for our pollies? Someone else’s problem in a decade’s time? •	Constructed from readily sourced and recyclable materials (metals, glass, concrete, water and thermal salt components and materials are relatively easy to source and recycle). Deployment of CST can keep pace with fossil fuelled generator retirements to enable an orderly, affordable, reliable transition that could provide a complementary major share of a 100% renewable energy electricity generation mix for Australia in future. Has Labor really thought through what needs to be done effectively to dramatically reduce Australia’s carbon emissions by 2030 and beyond, or is their energy policy just being politically expedient? Apropos the misapprehension: “South Australia’s Aurora project’s lone CST generator unit, due to begin construction shortly”, as mentioned upthread, South Australia has had CST in operation for nearly a decade from pilot, and several years as a $205 million production facility. Sundrop Farms (check wikipedia entry, etc.) uses the 39 MW CST plant to provide heating, electrical power, and desalination of seawater for 20 Ha of greenhouses, employing around 200 people. OK, it’s Danish technology, but full marks for taking it on, and showing the myriad technology followers out there how it’s done. Concerns about waste recycling are real – just look at glass. Recyclers have burgeoning mountains of the stuff, crushed, heaped, and with nowhere to go. At least lithium is valuable, and no council will allow big piles of dead batteries left in paddocks, so battery recycling is more assured the more there are of them. Economies of scale then make it profitable. Simples. tub, which would just go into existing recycling flows, I figure. As for government policy on carbon emission reductions, whether lab or lib, Saturday’s thrashing of the heel draggers in Victoria’s election seems to show that PV subsidies are popular. I suspect that a problem with Snowy 2.0 is it rates as Showy 0.2 – there’s nothing to see on people’s roofs, so does it really exist? And then, in which decade will it cut in, good as it’ll be in reality? I stated: “…Aurora project’s lone CST generator unit”. The South Australian Aurora project has one (i.e. lone) 150 MW capacity with 8 hours energy storage generator unit. I did not say that South Australia has only one CST generator unit – you’ve misread what I had stated. The Sundrop Farms’ small CST unit is intended to provide energy for its operations on its agribusiness site, whereas the larger Aurora CST project is contracted to feed energy into the electricity grid to supply SA Government operations (i.e. schools, police, government departments, etc.). You state: “…and no council will allow big piles of dead batteries left in paddocks, so battery recycling is more assured the more there are of them.” Do know any Australian councils (or state/federal governments) that have specific policies or regulations now that insist on recycling “dead batteries”? Please identify some of them, and evidence of successful compliance with these policies/regulations, or is your statement that “no council will allow big piles of dead batteries left in paddocks” just wishful thinking? I think Australia has a long way to go to catch-up with recycling schemes in Europe, but we all need to become much better at recycling as we live on a finite planet. It’s clear you are a fan of the “ZBM2 / Z-Cell”, but any battery (or pumped-hydro energy storage) system is only as effective as the primary energy supply feeding it. You appear to be ignoring this. New utility-scale solar-PV and wind are now cheaper than new nuclear, coal and gas. Capacity factors for utility-scale solar-PV are not much better than about 30%, and site-specific wind is achieving not much better than 50% (the average for wind is lower), whereas CST with adequate storage could achieve 70% (per BZE’s “Stationary Energy Plan”). In comparing operational lives, solar-PV panels degrade over time (typically down to 80% nameplate capacity after 25 years’ service) and inverters lasting on average about 10 years, wind turbines last about 30 years, whereas CST are designed to last 40+ years. These characteristics mean much more nameplate solar-PV and wind capacity (as well as significant battery/PHES charge/discharge losses) is required for ‘firmed’ solar-PV/wind with batteries/PHES, compared with inherently ‘dispatchable’ CST with adequate storage. And then there’s the question of how easy it is to recycle solar-PV panels, inverter electronics, and wind turbine blades? In summary it’s likely: CST can have higher duty factors with less overall energy losses, meaning significantly less nameplate capacity is needed; longer operational life, and probably more easily recycled materials that are readily available, meaning significantly less whole-of-life energy costs enabling higher Energy Return on Investment (EROI); compared with ‘firmed’ solar-PV and wind primary energy generators. I’m not saying CST is the “silver bullet” that solves all our problems – a mix of renewable energy technologies is probably required. Humanity needs to get a whole lot smarter and act effectively and rapidly to mitigate/avoid an energy security and climate change existential threat looming. There are a number of valuable recycle-able chemicals and metals in LiIon batts and I’m pretty sure we could quickly come up with a deposit scheme or a trade-in scheme that makes them almost impossible to throw away. There are already thousands of people around the world scavenging old laptop batteries to build home storage systems. And just like CST it is not a silver bullet – but it can be part of the solution. Thanks for the link. Are these schemes voluntary or legislated as mandatory? The point of my question is that we need to be recovering the materials (i.e. casings, chemicals and metals) in batteries as much as possible to minimize as much as possible what ends up in landfill (either here in Australia or shipped and dumped elsewhere in the world). If Labor policy is to promote a large uptake of battery storage systems then I think they should also have an accompanying effective policy on battery recycling – not rely on voluntary schemes that may not achieve very high recycling rates. Something that perhaps rewards those that recycle and penalizes those that don’t, and as you say “makes them [i.e. batteries] almost impossible to throw away”. Geoff Miell – for some reason there is no reply button on your last post so I’ve replied to your previous one. Hope you get it. No idea, I just know there are hundreds of them around, being run by councils, businesses like BatteryWorld and environmental organisations. I know it’s illegal to dispose of lead acid batteries through regular waste. Doesn’t mean it doesn’t happen. Well I’d completely agree on that – in fact I’d go further, make it for all batteries sold in Australia because currently 97% (most of them alkaline) end up in landfill. Switzerland on the other hand recycles 72% so it is achievable. Don’t forget I don’t really like the battery subsidy scheme as I believe all it does is push prices up and have minimal benefit to the consumer. And apart from being a renewable advocate I’m also a consumer advocate (though it’s not my day job). It seems we are in agreement on this issue. We need to be pushing hard to achieve 85%, 90%, and perhaps to 95%+ recycling. And that includes designing and manufacturing equipment so that it’s more readily recyclable. We live on a finite planet, so the more losses there are the harder it is in future and for future generations. See YouTube video titled “EXTRACTED – How the Quest for Mineral Wealth Is Plundering the Planet” from about time interval 6:52. Subsidy schemes always need to be carefully thought through to avoid unintended consequences – like the pink batts scheme. I didn’t say I didn’t like microgrids – they have a (i.e. some) place. I repeat: Humanity needs to act urgently, rapidly and effectively NOW with the best solutions that are currently available and deployable NOW. That should be Australia’s imperative, but our leaders seem to have other ideas. You’re stuck in the energy grid mindset. If enough households install solar and battery capacity you could get away from the expensive model of distributed power and instead replace the grid with microgrids. Or at least transition to that. If we were to start from scratch, pretty sure this is how we’d do it with today’s technology. And your worries about recycling batteries seem a little out of proportion – in fact they are a valuable recycling commodity for a battery manufacturer and you might even get to the situation where manufacturers offer a discount for recycling your old battery. Plus they aren’t all going to “expire” in “several years time”. The warranty on a battery is usually a minimum of 10 years and the useful lifespan might be 2,3 or even 4x that. Especially in a home storage situation with less cycles than an EV. Like any other product there’ll be different qualities and different lifecycles. It will be much more orderly than taking a giant coal plant offline. Personally I’m not convinced subsidies benefit the consumer so I’d prefer to see a different economic driver to encourage battery take-up. I, also, am not convinced subsidies necessarily benefit the consumer. After all, I doubt STC’s grow on trees – these will be purchased by “filthy fossil fuel generators” (to quote Ron) – but like any business, who do we think are going to have to pick up the tab? Or if the Government pays (or subsidises), where do we think they will get their funds from? Ron sent me a link showing estimates for payback on solar systems – a little historical – that show a simple payback of 7 years in WA (for a 5kW system). I’d think this would make such a purchase questionable – not only that, but I’d think the time-value of money should then also be considered (discounted cash flow). This made me sit up and take note, as I thought we were doing better than that. It was with some serendipidy that we had just reached the 2nd aniversary of installing nominally 6.24 kW of Tier 1 panels, with a 5 kW SMA 3-phase inverter. Our system had produced 20,000 units, within a day or 2 of the anniversary – a lot better than the 7,800 units modelled. interestingly, the installers had estimated 10,021 units per year (go figure)!!! Now, we have more panel capacity than Ron’s model, but the panels are less optimally positioned, and I found our self-use was only 21% (not 25% modelled). Nevertheless, even allowing for the slightly lower tariff for the first 20 months, our payback is showing as 4.2 years (2.2 years from now). But this got me thinking – after the first 8 months Western Power nearly doubled our supply charge – then 12 months later both the tariff, and the supply charge were both increased another 7%. Is this simply a case of Western Power “clawing back” some of these RECS costs (we have a lot of coal-fired generation) – this being spread over the whole community? Great for people who own domestic solar PV, as they are being subsidied by all those who haven’t, or cannot (rental, location, etc.). So – I tend to think (with all respect to Ron), that payback of a heavily subsidised cost (I got a $4,902 subsidy/rebate, more than half the cost) is to my mind a little “fake”. If I allow for the true full cost, the payback works out at 10.1 years – which to me is a risky proposition – will the inverter last that long? So – whilst I think that people can make real savings as individuals, I don’t think this necessarily implies the technology is as automatically more efficacious than other technologies – nor do I think it is likely to prove sustainable – for example, as PV permeates more, then conventional generators will be forced the operate less and less economically, or even at a loss to keep the grid stable and to produce at night – and increase tarrifs up to SA levels – and then we will all be able (required?) to buy batteries, whatever the cost – and pay for synchronous condenser costs and losses, etc.? Sorry – I’m personally making “savings”, but I’m not convinced this is of National benefit, nor that the “savings” include additional taxation and increased charges. Nor that PV is as good as purported. Totally agree. Where is the money coming from. ?? Higher prices? Carbon tax? Like the pink batts scheme and that killed 2 people this will be a disaster. I’m not a great believer in global warming. I do believe were killing this planet but not by co2. Any govt subsidies will raise prices. Look at labors 60cents in the dollar feed in tarrif. Have you done detailed modelling to show convincingly and unequivocally that’s possible in ALL weathers and seasons for ALL of Australia’s electricity needs now and into the future, or is that just your unsubstantiated “gut feeling”? And what about supplying heavy users of ’round-the-clock’ energy, like aluminium smelters, or steel producers? Or are you suggesting that we do away with these industries? I suspect you are just looking at your own domestic needs and not looking at the bigger picture. Geoff – with all due respect I am not a corporation with engineers working for me to do that kind of modelling. There are currently experiments underway with microgrids in Australia so lets wait and see the outcome of those and see how they work and what the pitfalls are. I was merely pointing out that buying into the grid mentality is only looking at one solution. How do we supply enough power to the grid? I’ve got no doubt that the grid will be around for a long time – what I’m saying is lets not let that be a stumbling block to a lower carbon economy. Let’s look at solutions like microgrids to take the pressure of the main grid and benefit small communities economically. Let’s look at making every new suburb a microgrid on it’s own – we already have similar environmental rules in place for new suburbs with water and waste – lets take it a step further and not even connect them to the grid. If it works. And aluminium and steel producers (and plenty of other industry) will always require around the clock heavy duty power (not that there is a lot of heavy industry left in Australia – we’ve outsourced most of that China) – you’re right – they’ll still require some investment in grid technology and even large scale energy like CST. I’m simply saying it doesn’t have to be a one size fits all solution. Thank you for being honest, confirming what I had suspected. It’s all very well to have opinions on various subjects. It’s far better and more productive to have opinions founded on data, evidence and sound logic/analysis. It seems to me that your earlier statement that: “If enough households install solar and battery capacity you could get away from the expensive model of distributed power and instead replace the grid with microgrids”; appears to have no evidentiary or substantive basis; apparently just your “gut feeling”. It was your apparent unfounded assertion that I was challenging. I put it to you that we cannot afford to “wait and see”. Humanity needs to act urgently, rapidly and effectively NOW with the best solutions that are currently available and deployable NOW. There’s sufficient data to indicate microgrids could/can be beneficial to communities and settlements that are isolated from, or where it’s too expensive to connect to, the electricity grid – so I think microgrids do have a (i.e. some) place, but I don’t think the grid will be superseded anytime soon. It appears to me your question about supplying enough power to the grid has been investigated by at least a few competent organisations, and affordable, timely solutions are available. BZE’s costings are now way out of date – wind and CST technologies are now substantially cheaper and better, and solar-PV has become cost-competitive. I think the AEMO’s ISP-2018 was restricted by a politically constrained brief, but despite this it still provides useful and important data. The time for waiting and seeing is over – effective emergency action is required NOW. In my opinion, based upon the evidence I see, Labor’s energy policy doesn’t go anywhere near far enough as currently enunciated. The COALition’s energy policy appears to be worse. I urge you all to be very careful who you vote for – our families’ futures are facing an existential risk with looming climate change and energy security/affordability challenges. Geoff, quite a number of steel mills in the USA have already installed solar PV to meet a substantial % of their electricity cost. http://solarlove.org/98-electricity-can-generated-solar-panels-alabama-steel-plant/ They expected to it to produce 98% of their power needs. That’s by no means a one-off example. If you do a search using the term ‘steel mills adopting solar energy’ you will find numerous other steel mills doing the same, including some Australian examples. One of the under-pinning reasons for the huge investment in ‘solar farm’ farm projects we now see taking place in Australia, and the large PV installations being carried out by major shopping centres and retailers such as Woolworths and Aldi is the ‘economics’ of PV now make considerable commercial sense. There’s no mention of energy storage in the article, so what happens when there’s cloud cover or it’s nighttime? The words “…to generate up to 98% of its electricity” is the clue. So it seems the steel mill is still dependent on the grid for when solar-PV isn’t providing adequate power. Energy storage is a key requisite for a high percentage share of renewables connected to the grid. But it’s doable. Please watch the YouTube video of ANU Professor Andrew Blakers’ keynote address on pumped-hydro storage and 100% renewable electricity, presented on 30 Nov 2017 (duration 37:54). Also see “Comparison of Dispatchable Renewable Electricity Options: Technologies for an orderly transition”, by Keith Lovegrove et al., prepared for ARENA, Oct 2018. The solutions are there for a 100% renewable electricity supply for Australia, and we could do it by 2030, if we had the will to do it. But it seems that both Labor and the COALition don’t have that will to go the whole way. Australian voters need to insist. The much more difficult problem is to rapidly transition away from petroleum oil dependency before we experience the beginnings of a sustained decline in global oil supplies – a post- ‘peak oil’ world. I expect any ‘transition’ to occur far more rapidly than the date of 2030. Forget any ‘orderly transition’, and its associated ‘political game-playing’, earlier change will occur simply because it will be forced upon us largely by natural events arising as a direct consequence of environmental ruin. PV power is merely a sub-set of the wider issue of world-wide environmental pollution. One of the issues Governments everywhere are facing is ‘What problem are we going to deal with first? Where is the money going to come from to do that? coupled with leaders of political parties who say and write such things as: ‘I’ve got nothing against renewables but there is 1600 coal-fired power stations being built across the world. Why can’t we use the coal, that we’re happy to sell overseas, here?’ See: https://www.onenation.org.au/forecast-renewable-energy-to-cause-summer-blackouts/ where ‘renewable energy is forecast to cause summer black-outs. The need to have a ‘reliable supply’ both day AND night is somewhat obvious. Unfortunately though, the multitude of arguments around the various alternatives that could solve that problem have been hijacked and employed to spuriously justify a case for ‘going slow’ on introducing renewables. Meanwhile… today’s news is that a legal challenge has been made against the decision by Federal Government Environmental Minister – Melissa Price to allow Adani the freedom to take 12.5 billion litres of water a year from the Stuttor River which will be used in the ‘scaled down’ version of the Carmichael project, without any need at all to do an Environmental Impact Statement ( EIS ). Ron sent me a link showing estimates for payback on solar systems – a little historical – that show a simple payback of 7 years in WA (for a 5kW system). I believe that I have previously mentioned the two domestic rooftop photovoltaic systems on our roof – one is 3kW and one is 1.5kW, the former installed in October 2013, the latter, in February 2014. The 3kW one paid for itself, in about 3 1/2 years, and, the 1.5kW one died in less than that time, and, due to consumer law, and, the way that the industry operates, the warranty was not worth the paper upon which it was written (I have previously posted the details of this. Amongst other benefits, whilst the 3kW one is insufficient to give us zero electricity import throughout each year, it does reduce the increases of electricity consumption, through summers. And, since we had that system installed (although, not solely attributable to that, but, more, to the widespread adoption of domestic rooftop photovoltaic systems in WA, we have not had summer electricity blackouts due to the coal-fired generators being unable to meet demand, for some years. So, domestic rooftop photovoltaic systems are good, and, it is shameful that they are not more encouraged by governments, and so, whether by the way STC’s are currently operated. 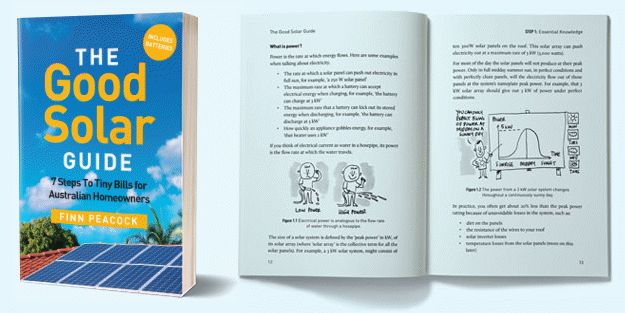 or, otherwise, the rebates from them, for domestic rooftop photovoltaic systems,, should not be reduced, but, should be maintained, and, the CEFC should provide no-deposit, interest-free, finance, to owner-occupier homeowners (including mortgagees), for the purchase and installation of domestic rooftop photovoltaic systems, with backup battery storage, to provide for grid electricity supply outages. The problem with using simple logic and clear explanations in analysing a policy is that politics doesn’t work that way. It wasn’t Tony Abbott making a decision to Axe the Tax that destroyed the carbon price it was that it worked. The voters put him into the Lodge and the climate wars escalated from rhetoric to policy mayhem. We can expect then that the ALP’s policy framework will have an emphasis on actual saleability and playing a part in once again grasping the levers of power which have been neglected during the last period of energy/climate paralysis. If your readers are interested in actually playing a part in having sensible, logical, fact based policy implemented it is fairly simple to have an impact. Join the political party or environment/lobby group of your choice and talk the talk. Labor has the Labor Environment Action Netwwork where you will be most welcome – but there are many many others – do something! Talk talk talk, the reality is if Australia sank beneath the waves tomorrow morning it would have absolutely no impact on global warming. for the next 30 to 50 years,If not our coal then another’s country’s. quality coal those new 1500 odd coal- fired power stations will obtain their coal from other sources, and not of the quality we can supply. Three percent. If Australia disappeared greenhouse gas emissions would be reduced by about 3%. If you want to sink something beneath the waves that will have negligible effect maybe you should go with Townsville. It’s barely above high tide as it is. What’s going on, P Bergild? Your uncle was a coal miner but you’re not aware Australia is the world’s largest coal exporter? Something strange is going on here. So if “Australia sank beneath the waves tomorrow morning” it would have a big impact on emissions. That adds up to a global total of 1,281 generator units planned + being built as at July 2018. But I suspect you are ignoring coal-fired generator unit retirements. In the first six months of 2018, 43 coal-fired generator units were added and 52 retired, meaning the global coal fleet shrank by nine units. From a nameplate power capacity perspective, in the first half of 2018, nearly 20 GW of new coal capacity was commissioned: 12 GW in China, 5 GW in India, and 3 GW in the rest of the world (South Africa, Pakistan, Vietnam, Philippines and Japan). This was nearly matched by the amount retired (16 GW), for a net increase of just 4 GW – the slowest rate of growth on record. If the slowdown continues, global coal capacity should peak by 2022, if not sooner. New coal-fired power plants are at high risk of becoming “stranded assets” as new renewables are now decisively cheaper. In some instances, renewables are also becoming cheaper than fully depreciated existing coal plants, indicating that coal will inevitably be displaced, and consequently global coal demand will be in terminal decline. So, I think Australia’s thermal coal will be competing in a terminally shrinking global market. It is therefore prudent for Australia to be planning for an exit from coal. was that the lobby group that got the Queensland ALP government to approve the whizzbang new 140km square open cut coal mine in Queensland, and, got the WA ALP state government to approve fracking up WA? The ALP has successfully eliminated its credibility regarding the environment. If the ALP and its state governments wanted to show that they would be genuinely interested in arresting the deliberate environmental destruction, and the deliberate killing of humans and other animals, the clear first step, is an immediate ban on any new coalmines, and, an immediate ban on increasing output from any existing coalmines. This is not the first time Adani has said they are going to open the mine and done nothing. If Guatam Adani intends to go through with it he’ll have to fund it with his own money as no investor will touch it without government subsidies which Labor refuses to give. I find hard to believe Guatam will do this as he has demonstrated a preference for more money rather than less. Fingers crossed he doesn’t. The controversial mine in the Galilee Basin has been scaled back significantly from earlier plans, following years of legal and environmental disputes. Adani Mining chief executive officer Lucas Dow said the mine would initially begin on a small scale and “ramp up” to a capacity of 27.5 million tonnes a year — less than half the size of the approved project. “We have finance and we are ready to start,” Mr Dow said. So, the Queensland state government is steaming ahead with expanding coal mining in the state. And so, with the Queensland branch of the ALP, showing solidarity with its parent company – the Queensland LNP – “We gotta burn more coal, whatever the costs”, BS Billy Shorten could be appropriately named Puffing Billy – the coalminer of Australia. Brett – some facts. Under the original Adani proposal it was going to be exporting 50 million tonnes of coal a year. Because of the lack of finance they’ve been forced to scale back those plans. They can’t afford the original railway so they are going with narrow gauge. They will (if it ever happens) produce about 10 million tonnes of coal a year under their “self-funded” model with the ability to “ramp up to 30 million tonnes a year”. As Ronald pointed out he’s made vague promises like this before. The feeling is the urgency at the moment is to forestall any political interference given the likelihood that Labor will win the next election. Much harder to remove approvals for a project that has already started. Read into that what you will. I don’t disagree that it’s a terrible project and the money could have been better spent on creating jobs in the renewable sector but the Labor party, like the LNP have stakeholders on the coal mining side that aren’t going to just let Shorten and Co do what they like. Like it or not – that’s democratic politics. It’s ugly (as Turnbull discovered) put it’s probably better than any of the alternatives. Whether you like it or not one of the major parties will win the next election – so pick a horse. It’s not correct to say that the two major parties have identical policies on Adarni and we should just pick a horse. Bill Shoten may be going along with Adarni at the moment but inside the Labor party not everyone is inside the same tent. It will be interesting to see how the issue is handled at Labor’s annual convention next month. I don’t believe I said any such thing. Read what I said again. I said both major parties had stakeholders in coal mining. To expand on that – the LNP in the form of the mining industry and the Labor Party in the form CFMEU (just go to the front page of their website to see their views on coal). And probably both parties in the form of donations. Who wins comes down to who has the numbers – that’s the ugly side of politics that I was referring to. Also correct is that many hundreds of millions of people world wide would become instantly and additionally energy starved – many off an already very low base, to a point resembling a step back toward Stone-Age, with dramatic community and national productivity losses across all economies, as well as the subsequent knock on effects of social disruption, chaos and starvation. Disruption to energy supply chains without long term warnings is equivalent to a national crisis without any immediate or stop-gap solution. On reflection, you wouldn’t support that scenario Geoff. So I recommend you bring a bit more rigor to your arguments Geoff from an interlinked global trading nations perspective, and readers will be more interested in hearing your views about future international trading inter-dependencies, and global energy generation science initiatives going forward. Humanity has had long-term warnings about climate change (an understanding of CO2 affecting temperature for more than a century, and increasingly better understanding since the IPCC was established), ‘peak oil’ (since Hubbert in the mid-1950s and Colin Campbell/Jean Laherrère in 1998), and resource depletion (“Limits to Growth” in 1972), and humanity seems to continue to ignore these warnings, as if we can pollute indefinitely and plunder infinite resources on planet Earth. The time-frame to respond effectively continues to shrink. The Club of Rome commissioned “Limits to Growth” in 1972 and it was generally derided by many. The CSIRO and others have recently revisited it and confirmed we are on track. If we don’t get fair dinkum about these diabolical, unprecedented challenges then we will soon be suffering the consequences – it could be argued some people around the world probably are (re climate change – wild-fires, droughts, sea-level rise, etc.). No, I definitively don’t. I say that our political and business leaders are abrogating their responsibility for protecting our futures. Too much ‘short-termism’. Are you asking me whether I have all the answers? Sorry, I don’t. But until humanity acknowledges the seriousness and urgency of the situation looming, we have Buckley’s finding timely, effective solutions. You are being kind when you say labor have not bothered to check the figures. “It’s possible Labor has been getting some bad advice, but I think it’s more likely they are just going with something they assume is true without bothering to critically assess the facts first”. It’s probably much worse than that. The probability is that some political “expert” has decided that the general population will think it’s a good idea, irrespective of it’s ability to reduce their solar bills and ignoring the negative effects it will have on the environment. It’s impossible to believe someone hasn’t pointed out the problems with their scheme. They are ploughing ahead with it rather than admit a monumental f&*^ up, hoping the general population continues to think it’s a good idea. The argument that ‘Right Now, Home Batteries Are Bad For The Environment’ because around 15% is lost – A similar amount of dirty electricity is however lost in transmission from a coal fired power station to your average house…so this would seem to negate your argument. Interesting, in India up to 30 % is reported as being lost. The battery subsidy will increase the take up off batteries – As with all new technologies it will take time for the economies of scale to lower per unit prices. The less early adopters ….the longer it will take for the economies of scale to lower per unit prices. Discouraging battery use is counter productive. We should be encouraging it…..
‘Home batteries can extend the operation of coal fired power stations’. – The argument is tenuous at best. Of more importance is renewables role in ensuring that we do not build more coal fired power stations (as some in the Coalition want to do) and we move away from digging coal out of the ground. This issue is not discussed but it is of critical importance. “If Labor wants to incentivise the uptake of home batteries it can do so very simply without spending a cent. All they have to do is eliminate, or at least reduce, fixed supply charges on electricity bills.” Surely, if this did occur, electricity generators would increase wholesale charges to compensate for the lost revenue…..
Talking of “lost” power I have questions regarding the power generators who supply our heavy industry consumers – the Tomagos of this world. Without any technical expertise I assume that eg Tomago will operate on a cycle of “melt and pour” during its operating hours. The “melt” period would call on very significant quantities of electricity from the local generator, but then the demand would drop like a stone when the melting pots were turned off. So what happens to all the electricity being churned out by the generator when Tomago isn’t using it ? Bearing in mind Tomago is reported to be paying less than 2c per kWh, who’s paying for the electricity being generated and wasted (?) by its dedicated generator ? They have four pots so might stagger them. But I am interested in the price they pay if you have any reference? It would not surprise me if they pay less than the average wholesale which means in effect they are subsidised by other energy users. I understand they have a contract with AGL (taken over from the State Government) until 2022?. Maybe that is why the panic over Liddell’s replacement is not the energy but the cost. Lovely article. I totally agree with batteries not paying for themselves. I keep daily KWh usage, and solar power generation in a spreadsheet, and have just done a daily “what-if” scenerio if I had a 10KWh battery, which I could use instead of providing surplus power to the grid. The results were a saving of $280 in a 12 month period (2017/18 FY). I didn’t factor in any battery power storage loses, or any discount with an electricity pay-on-time plan. If one also factors that batteries need to be serviced say once every 2 years, then it just makes no financial sense. You also mentioned about removing the daily charge. In 2007, my NSW electricity had no daily charge. The government then introduced a 20c/day charge, saying that zero usage households (eg holiday homes) were being subsidized by those who used electricity. My connection charge is now $1.50 a day. And who is profiteering from this?